This is Benny and Scotty. They first met Maggie in 2000 when they were out walking in the countryside. He was just a small, scruffy looking young magpie sitting on the fence. He could see them coming for yards, but he did not hop or fly away: what an unusual bird! 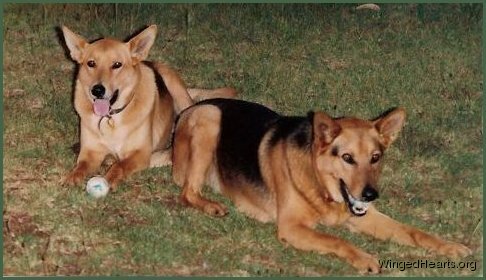 But Scotty and Benny were very friendly dogs and they didn't try to hurt Maggie, they just went right over and gave him very big dabs on the chest with their noses. They became friends instantly. Maggie followed them home and made it his home too. Scotty and Benny let Maggie share their dinner bone and would protect him from the bigger birds. But Scotty and Benny were very old, and a few months later they left Maggie and us. We didn't want to lose touch with their bird, so we made friends with Maggie, who introduced us to his family and other bird friends. Maggie, along with his step-sisters Cindy and Tammy and his foster parents Fatty and Molly, showed us the amazing world of relationships, negotiations, and the love, affection, and friendship that exist amongst the magpies and their vast bird network which includes butcherbirds, noisy miners, babblers, kookaburras, currawongs, crows, lorikeets and many more. (To view slideshows about these and other species visit the Birds I View gallery of this website.) Stories and slideshows about their friendships and activities are presented in The Sticky Beak, Feathery Tales, Grounded! Not Just A Bird.. and Winged Tips galleries.